Starring: Taron Egerton, Hugh Jackman, and more. A good underdog story goes a long way these days with so many people of the world being considered exactly that. There can only be a handful of number 1 top dogs and everyone under them are the underdogs. Whether they are chomping at the ankles of the top dog at the number two position or if they are the bottom of the barrel just trying to prove to themselves that they can do exactly what they set out to do. ‘Eddie the Eagle’ is the latter. ‘Eddie the Eagle’ is the the motion picture production telling the story of Michael Edwards, aka Eddie the Eagle. A true underdog story that rocked film festivals and many viewers who took witness to it. The breakthrough star of Kingsman and Wolverine himself deliver a historic story. The story of ‘Eddie the Eagle’ begins with 10 year old Eddie Edwards (Taron Egerton) as he goes through trial and error to find out what kind of an athlete he wants to be in the Olympics. The young lad through his years tries everything from javelin, to hurdles, to pole vault, to… underwater breathing? That is a new Olympic sport to me… Anyway… The young Eddie tries it all. After continuous trial and error, he realizes that the summer Olympics is not for him… The winter Olympics is. He then takes an interest into skiing but an unfortunate event bars him from reaching his goal of competing in the Olympics for Britain. But after all these years, Eddie Edwards does not simply give up after being told “No”. Eddie then discovers yet another event he wishes to try which directs him to Germany on his last try at becoming an Olympic athlete. Once in Germany, Eddie does what he does best; uses his unbreakable will and determination to find a way to become the athlete he always dreamed of while recruiting some reluctant help along the way. Early on, I caught wind of this movie from social media posts from Taron Egerton and Hugh Jackman. 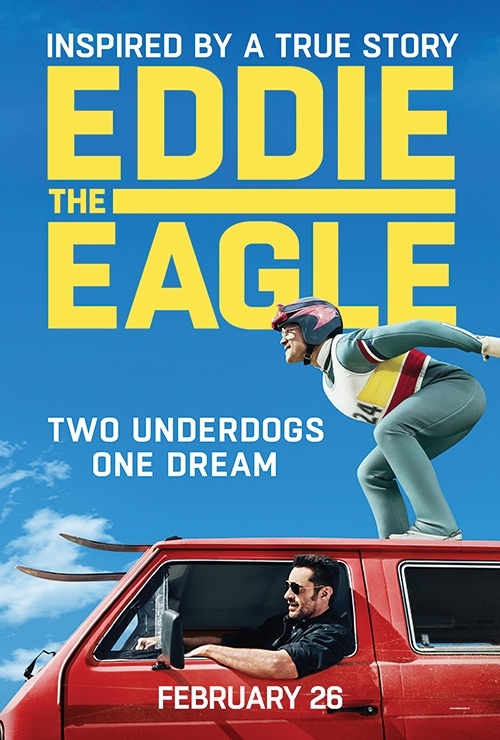 Being big fans of the both of them, I was instantly turned on to the idea of this film, but one certain quote caught my attention which made this movie a must watch for me, “‘Eddie the Eagle’ isn’t just for sports fans, it’s for anybody who’s ever been told ‘No! '” It is the perfect underdog movie and it was done fantastically. The film made waves at film festivals all over the nation. Critics raved about the film once it was finished and now I fully understand why. Taron Egerton is a superstar in the making. His few roles he has starred in he has performed immaculately. Hugh Jackman is a constant success, grabbing each of his roles by the throat and executing them flawlessly. The story as a whole is a wonderfully put together and memorable piece of work from start to finish (with obvious holes since you can not cover a whole life in an hour and thirty minutes). Overall, this was just a fantastic film. It leaves you feeling good and has you cheering for Eddie the underdog the entire playtime. I majorly recommend this film for anyone interested if you like a goodhearted underdog story.